I’m delighted to share with you another interview with a YA author! This week it’s Lori M. Lee, whom I’ve been following online for quite some time. 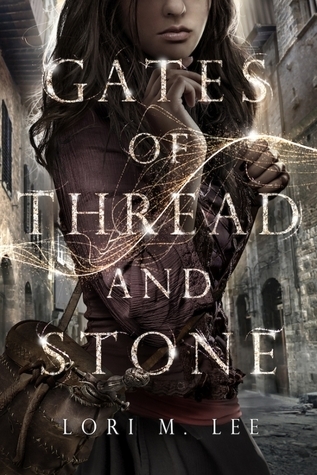 Her debut GATES OF THREAD AND STONE is a YA Fantasy which will be released on 5th August 2014! Pretty much 🙂 I’ve wanted to be a writer since the third grade. Other career choices popped up along the way (I’m particularly fond of my brief “become a model” goal, because I’m sure THAT would have worked out haha), but writing has always remained my steadfast dream. I use the spare bedroom as an office. For now. Once my son is old enough, he’ll get the room, and I’ll return to the kitchen table. I write primarily when my son is asleep, because that’s when I can focus best. Otherwise, I’m being constantly distracted even when my husband is watching him (although, partly it’s b/c he’s just so darn cute). The nice thing about the office, though, is I can shut the door! What do you say to writers who want to be published one day? Read and write a lot. Be informed. And don’t give up! Kai, as a character, came to me when a friend said something in passing about time, which I can’t actually tell you because it’s a spoiler for the book lol. But as to her abilities, I wanted the flow of time to be almost a physical entity—thus the threads—and for her magic to have clear limitations based on this. Why did you choose to write for young adults? It wasn’t a conscious choice. It’s the category of books that I’ve always been drawn to. Even when I was twelve, well before “young adult” became a legitimate industry category, I was writing characters who were seventeen, although then, it was because those were the heroines I wanted to become. Now, I write about young adults because that period of our lives still resonate the strongest with me. I can’t imagine not writing young adult. I am working on book two, although I’m also pulling together the world building and general plot of a new fantasy project. Thanks for the interview, Lori! You can add GATES OF THREAD AND STONE on Goodreads here. 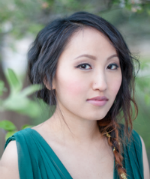 This entry was posted in A writer in the spotlight and tagged 2014 release, a writer in the spotlight, EM Castellan, Gates of Thread and Stone, Lori M. Lee, YA Fantasy, YA writer's interview, Young Adult literature. Great interview! Can’t wait to read Gates of Thread and Stone, it sounds amazing.